Tiki Cocktails & Kool Ideas for Labor Day Weekend! How about this cheesey, '80s-retro-style diner sign I made? As if it were in a diner in the 1980s that was trying to look like it was from the 1950s. All it needs is Cheap Trick playing Don't Be Cruel. Throw it all in a shaker with rocks and shake it up good. Strain over cracked ice in a hurricane glass or Tiki mug, and garnish with an orange slice and a cherry on one of those little plastic swords. Add an umbrella and a flamingo swizzle stick and viola! 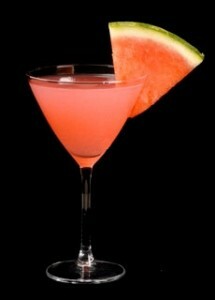 Rim: Mix together the sugar and salt, then wet the rim of a chilled martini glass with a piece of watermelon. Dip the rim into the mix. Throw the watermelon juice, vodka, lime juice, and simple syrup into a shaker with ice and give it a good rattle. Strain it into the martini glasses and garnish with a hunk of watermelon. Oh, yeah! To do this right you’re going to have to find a butcher or a deli that sells Quarter Pound Hounds…jumbo all-beef hot dogs that blow away anything you’ll find in a plastic package. If you can’t, next best thing is Ball Park all-beef (or Angus), or Sabrett’s. Prep: Boil the dogs for about five to eight minutes in beer – Miller High Life or Pabst Blue Ribbon, to stick to tradition. This cooks them all the way through and infuses a nice lazy hazy crazy days of summer beer taste. Grill: First of all, you can’t BBQ retro with a gas grill. No Patio Daddy-O is going allow propane in his back yard, so get charcoal and hickory wood chips like a real man. Soak the chips in water for at least an hour. Get the coals burning and when they ash over, place some wood chips on top and watch them start smoking. Put the hounds on the grill and let them smoke for a few minutes, turning so they don’t burn. Take ’em off when they start to turn dark brown (if you like them blackened like my lovely wife does, leave them on a little longer. They’ll char up nice). Serve: Don’t skimp on buns. Get good quality dog buns, fresh if possible. Potato rolls are great too. Add your choice of condiments (but not ketchup, dammit) and enjoy yourself. 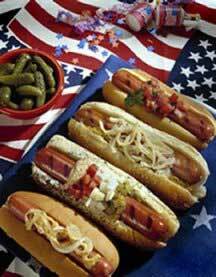 Personally I like spicy mustard, sweet relish, a little onion and occasionally kraut on my dogs. Mix it up: A variation on this is to add a little hickory BBQ sauce to the dogs, if you dig it. Also you can add some chili to make the most incredible chili dogs you’ve ever tasted. You don’t have to be a whiz in the kitch to pull off this recipe. Click here for the post. Top off with Pineapple chunks and decorate with little Tiki toothpick flags, or whatever you have. Serve it chilled. It’s sweet, but sooooo good. If you want to kick it up a little, drizzle some Kaluha over each serving. Uhhh-huh. Have A Labor Day Luau! Click Here for my post on having a groovy tropical Labor Day Luau the easy way. Great for you kids that dig Tiki but don’t have your home devoted to it. Well kids, I hope some of you get a kick out of the stuff I’ve posted here. It will probably be raining here all weekend (Hurricane Earl’s kickback) so we’ll probably hit Machete at the movies and stay inside…or at the Tiki Bar under the lanai, at least. 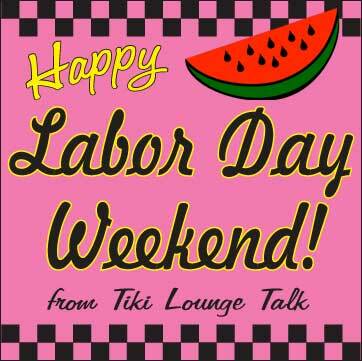 -Happy Labor Day Weekend from Tiki Chris and the staff at Tiki Lounge Talk: Colleen, Tiki the Cat, Cat the Cat, Rio & Zack (the Parrots), Simon & Sidney (the Cockatiels), and our temps Lucy, Faith, Betsey, Merry, Lila, Fry & Amy.